A Somerset Cheddar with fruity grassy notes made on the Keen family farm. When they moved to Moorhayes Farm in Somerset in 1899, the Keen family brought with them a tradition of cheddar cheese-making that is still being used to this day. They use the precious milk from their own herd of British Friesian and Ayrshire cows, and each cheese is allowed to mature up to a year. The cornerstone for a classic cheeseboard, this chedder will pair beautifully with fine claret or vintage Port. A Somerset Cheddar with fruity grassy notes made on the family farm Strength 5 Made from raw cow's milk. 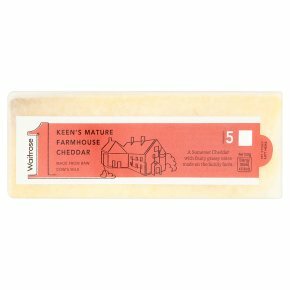 When the Keen family moved to Moorhayes Farm in Somerset in 1899 they brought with them a tradition of cheddar cheese making that is still being used to this day. Using milk from their own herd of British Friesian and Ayrshire cows, each cheese is allowed to mature up to a year.